Our Internationally patented products provide on counter advertising information at point of sale that’s easy to use, easy on the environment and easy on your budget. They display your information at the decision point and being made of cardboard, they testify your committment to a greener, smarter world. EZIPOPs are unique, they stand out in the busy marketplace you compete in, because they're visually striking, strong, eco-friendly and an economical way to communicate your company's brand, logo, products and message. And they're the only internationally patented cardboard brochure holders in the world. They're made in standard metric / imperial sizes like A6, DL, A5 and A4, or they can be custom-sized for your needs. Product dispensers are custom-sized to suit your product and like our brochure holders, they’re economical, green and recyclable. EZIPOPs can ship flat, then pop-up when you’re ready to display, adding considerable WOW to any campaign or promotion. To increase compliance, they can be pre-filled, ready to simply pop up on a counter, making them the easiest dispenser for anyone to display and due to their patented two layer construction, they're strong and durable. They're environmentally friendly too, being manufactured from cardboard that's sourced from sustainable forests, is elemental chlorine free and conforms to ISO 1401 EMS Certification. Printing is best practice and environmentally-friendly. EZIPOPs save on transport, storage and distribution costs due to their low weight and ability to ship flat. 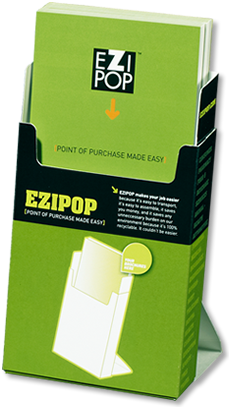 EZIPOP brochure holders or stands can be custom printed and finished in a variety of ways. If your requirements can't justify custom printing, take a look at our Generic or universal EZIPOP. They're ideal for quantities under 500 and are kept as a stock item for immediate delivery. Like more information and pricing? Got a question?